The show, the whole show, and nothing but the show…. “When I think of a powerful expression of nature and its complex beauty, I think of a hurricane, with its enormous reach, peaceful center, and capacity to transform boundaries of where land meets water meets air. After surviving Hurricane Irma and living to write about it, I have come to understand and appreciate the power and soul of nature and its capacity to express the harsh physics and loving spirit of the universe, unaccountable to the whims of human follies and intervention. When I think of the powerful expression of the human supernatural and its complex majesty, I think also of Aretha Franklin, a blessed hurricane of love, soul, and justice. It has been not long since our Queen of Soul — force of nature, a gift from the heavens — left us. The loss is still fresh as we continue to mourn, reflect, and find our unique way to both collectively and personally celebrate her life, legacy, and greatness as an American legend and worldwide soul ambassador. She gave us so much. She taught us the power of respect, grace, and our responsibility to think. She inspired multiple generations from multiple places: spiritual, social, cultural, and political. Her voice led a grieving nation through our lowest moment with the death of Dr. Martin Luther King Jr. and to our most resurrective high with the inauguration of President Barack Obama. John Sims, a Detroit native, conceptual artist, writer, and activist creates both art and curatorial projects spanning the areas of installation, performance, text, music, film, and large-scale activism, informed by mathematics, design, the politics of white supremacy, sacred symbols/anniversaries, and poetic/political text. He has worked with a wide range of artists including Sol LeWitt, Karen Finley, and Dread Scott. Sims has lectured and exhibited widely including in Hungary, Spain, Israel and Argentina and most recently in Slovenia. In 2017, he made the National Coalition of Against Censorship’s list of Top Free Speech Offenders and Defenders, as a defender. His work has been featured in The New York Times, The Wall Street Journal, Washington Post, CNN, NBC News, The Guardian, The Root, ThinkProgress, Al Jazeera, Guernica, Art in America, Transition, Sculpture, Science News, Nature and Scientific American. He has written for CNN, Al Jazeera, The Huffington Post, Guernica Magazine, The Rumpus, and The Grio. 30 on. x 30 in. Phillips pulled the image of a young Franklin off the internet, a black-and-white picture in which she’s wearing a white hood that frames her face. The artist often adds 23-carat gold leaf to his oil paintings — and in this case changed the white hood to gilt. “I wanted to gold-leaf the garment,” Phillips said, “to give her an angelic look.” He succeeded. Jason H. Phillips is a painter, mixed media artist, muralist, and tattoo artist. He creates work that reflects the African American cultural experience, and chronicles the intersection of beauty and struggle. Owner of the Detroit Ink Spot Tattoo Studio and Co-founder of the Black Tattoo Art & Music Expo, Phillips earned a Bachelor of Fine Arts from Wayne State University. His work has been shown nationally in galleries and museums. The most recent addition to his public art collection is the 240 square foot oil painting located in the front lobby of Advantage Health Family Service Center in Warren, MI. Jason’s illustrations have been published in University of Michigan’s “Michigan Project on Oral Language, Writing, and Reading” project, which resulted in a series of books created to assist with language development for school age children. This rare Artis Lane portrait stems from the original artwork series developed for Who’s Zoomin’ Who? – the thirtieth studio album by Aretha Franklin, released by Arista Records in 1985. Considered Franklin’s comeback album, Who’s Zoomin’ Who? became her highest-charting album since Young, Gifted and Black (1972) and her first and only studio album to earn a platinum certification from the Recording Industry Association of America (RIAA), with over one million copies physically distributed. A top ten entry in New Zealand and Sweden, the album also went platinum in Canada and reached silver status in the United Kingdom. Freeway of Love, the album’s lead single, proved both a commercial success, as well as a career achievement for Franklin, earning her a Grammy Award for Best Female R&B Vocal Performance while holding the number-one position on Billboard‘s Hot R&B/Hip-Hop Songs chart for five consecutive weeks. Artis Lane’s respected talent was sought to create the cover portrait for this recording, which would become one of Franklin’s seminal works. Artis Lane is a Black Canadian sculptor and painter who was born in 1927 in North Buxton – a small town in Ontario, Canada, in a community largely populated by the descendants of slaves who emigrated to Canada on the Underground Railroad. At two years old her family moved to Ann Arbor, Michigan, where she developed an interest in art. She received a scholarship and degree from the Ontario College of Art in Toronto, Ontario, continued her education at the Cranbrook Academy of Art, and settled in Detroit with her husband, journalist, Bill Lane. Widely known for her sculptures, Lane’s commissions include a series of bronze portraits for the Soul Train Awards, a bronze portrait of Rosa Parks for the Smithsonian Institution and designing the original logo for the Dance Theatre of Harlem. She has created public sculptures of prominent figures, including former President George H. W. Bush, Bill Cosby, Walter Annenberg, Michael Jordan, Gordon Getty, Nelson Mandela and Henry Kissinger. The National Congress of Black Women commissioned Lane to create a bronze bust depicting women’s-right advocate and abolitionist, Sojourner Truth. The bust was unveiled in 2009 by First Lady Michelle Obama for permanent display in the Emancipation Hall at the Capitol Visitor Centre. Lane was honored in 2013 as recipient of the Women’s Caucus for Art Lifetime Achievement Award. She currently resides in Los Angeles, California. “Through hardship I connect to my practice as an artist as a means of channeling the Divine Feminine energy. When feeling this connection to the higher power, I feel a strength and creativity in me that my body could not create on its own. In this way, I feel I am fortified by women around me and those that have come before me. I believe Aretha Franklin understood this power and channeled it with such mastery that she has become a symbol of feminine power. Themes of Femininity are central to my work. My materials, as well as my method of employing them nod to traditional women’s craft. I often use fabric within my paintings or, use textile pattern to inform my aesthetic decisions. I am concerned with radical liberation and its connection to sexual liberation. I am interested in exploring intimate justice; the ability for women to be sexually and interpersonally satisfied. I exaggerate and amplify my color palate; to create vibrations within the viewer that symbolize, to me, the female body. Cyrah Dardas is a Detroit Based multimedia painter and community organizer. Her work examines modern American femme identity, specifically, in the context of blended families, mixed and multiracial people. Cyrah’s Persian heritage informs her interest in pattern, method of stylization, and composition. Taught garment-making, knitting, crocheting, and embroidery early in life, her fiber arts sensibilities impact her practice and greatly inform her aesthetic decisions. Cyrah received a Bachelors in Fine Art with emphasis in Education from Wayne State University in 2015. She has worked locally and internationally as an art educator; facilitating art classes, open studios and after school programming with youth. Cyrah, alongside co- facilitator Bree Gant, founded an Intersectional femme artist collective called Art Babes, a group dedicated to creating supportive spaces for femme creatives to make work, share resources, and promote themselves. Led by Cyrah and Bree, Art Babes have exhibited in 2 shows already and have more in process for 2018. “I read somewhere that she used to wear capes early on in her career. Capes symbolize something super and magical but they are also protective. They are an indication of something out of the ordinary, spectacular, and there is no doubt that Aretha, her voice and her being, were way beyond anything the world had ever experienced. Our SuperWoman’s Cape is not gilded, shiny or red. It is not flowing in the great blue beyond. It is tattered and torn, shredded but whole. It is culled from the fields from which our foremothers toiled. It holds secrets and pain, yet continues to nurture life. Its beauty is in its story; its sweat, tears, and purpose. Aretha carried this burden and blessing in her voice, lived this truth with her life, and privately wrapped herself this figurative cape when the dark of night descended…. Amber Doe has exhibited work professionally for over six years. Her work has been exhibited in unique and exciting venues like the luxury hotel The Thief, in Oslo, Norway, K supermarket in Hämeenkyrö, Finland, Gabriel Rolt Gallery in Amsterdam, La Ira De Dios Gallery in Buenos Aires, Argentina, Scottsdale Public Library, Scottsdale, AZ, Can Serrat Gallery in El Bruc, Spain, Biblioteca Communale Como in Lake Como, Italy and LeRoy Neiman Gallery in New York City. Doe has also published poetry and prose in Finnish journal, Hesa Inprint. Most recently, Doe has published “The Last of the Red Hot Lovers” in the African American Horror anthology Sycorax’s Daughter, a finalist for the Horror Writer Associations Bram Stoker Award for Superior Achievement in an Anthology (2017). Doe received a Bachelor of Arts from Sarah Lawrence College with a concentration in sculpture and filmmaking in 2002. She was raised on an Indian reservation outside Charlotte, NC and Philadelphia, PA, and currently lives in Arizona. Mythology and history are foundations of Amir Bey’s work. The figures in the Equinox Celebration Tarot series have been evolving since 1976. Throughout these decades, Aretha Franklin has been a constant. And she, too, a work of art, was evolving. There have been four series of these images: the original stone carvings, bronze casts, and two series of mobiles cut in thin sheet metal. Part of this final series, She Brings the Gift of Music, refers to the abundance that Queen Aretha brought to people. Aretha’s abundance, not only in music, but in character, in spirit, and in being, was a gift to mankind for decades – lifetimes, even. She was the gift that flowed through her music. Amir Bey, mixed media sculptor, occult artist, curator, performance artist, radio program producer and writer, was born in New York City and spent his formative childhood years in Ann Arbor, MI. His first exhibit was at age 11, in a children’s show held at the University of Michigan, Ann Arbor. A self-taught artist, his work is marked by an independent, free approach. The development of his artistic expression has been influenced by the places he lived, from his early childhood and teens in New York, his years in Michigan, and finally the time he lived in the mountains in California, where he worked with stone, deer antlers, and leather, later shaping his mixed media sculpture ideas. Bey collaborates with performers, creating costumes, and set designs, used in performances. He has performed with or had work in collaboration with Idris Ackamoor, Rhodessa Jones, Saco Yasuma, Lorna Littleway, Maria Mitchell, Tayuta Pilgrim, and most recently the Elevated Moon series with reed player and composer JD Parran. He has exhibited and collaborated internationally, including Japan, Turkey, Martinique, Spain, and Germany. Curating and organizing over 100 exhibits and events, he has often combined exhibitions and performances held mainly in the New York City area. In Berkeley, California, he was a radio program producer and broadcaster at Pacifica Foundation’s KPFA-FM, in shows such as The Souls of Black Folk, 3rd World News, and his own show, Black Air, in the early 1970s. Later, he broadcast Parallels between South Africa and the United States at Pacifica’s WBAI-FM in New York. Bey’s. The Procession of Folk #3, a series of twelve sculpted faces are permanently installed by the MTA, New York City’s transit system. “There are few individuals who truly master their craft as did Ms. Franklin. As a visual artist I cannot describe her technical depths. I do know she was singular. The sound of her voice would echo in my depths before I could even bring my lived experience to her words. I heard Respect in my first year of High School, she would continue to shape for me the experience of my generation. Respect was followed by Think that pushed open a window to radically understand another. For me as a young activist in the community her voice was sound track for action raising a level of feeling that shaped a new way of listening. She was a vehicle of grace hard wrought from this earth that rescued despair with self-empowerment. She sang me through what I lived through decade by decade. Many more knowledgeable will speak to her background in Gospel, I only know the tremors of my own soul stirring as I listened to her. She opened doors and made our worlds bigger and joined across color and fortune. She modeled a testimony of life that could wring love from rocks. She made us demand better of ourselves and each other. Noreen Dean Dresser is a native of Cleveland, Ohio residing in Harlem, New York. She studied Fine Arts and Art at Antioch College and Art History in the U.S., Greece, and Italy respectively. Committed to transformation, Dresser studied a comparison in five countries and Urban Planning in Europe with a specific interest in guest workers integration into host societies. Her commitment to others served when she was staff at Watts Towers Art Center as part of the Pacific Time Movements of African-American Art and Feminism. Her professional experiences have also included service on the College Art Association Executive Committee for Women in the Arts and serving as President of the National Board Women Caucus for Art. Dresser’s experiences in Federal Services have afforded her a unique perspective on landscapes, as well as the opportunity to study the environment and changing weather patterns. This, along with her keen sensibilities in art and community service, provides the backdrop for her work, which largely addresses environmental concerns and examines severe storm systems. Noreen has exhibited throughout the Tri-State area, Ohio and California, and is the Director of Parlour 153, a visual and performing arts salon in Harlem. Traveling to Turiya is a sculpture installation that outlines how to attain turiya – pure consciousness in Hindu philosophy. Commissioned by the Arcus Center for Social Justice at Kalamazoo College in Michigan and originally inspired by Alice Coltrane, the series includes thirty-one sculptures involving over twenty varieties of crystals – such as pyrite, black tourmaline, amethyst, and bismuth – that LaFleur believes can heal traumas and help us transcend the cosmos. Through Traveling to Turiya: The Future Mapping Project, LaFleur investigates the theory that de-colonial futures can be created only when all trauma is cleansed from the body. Transcending the human experience is the only safe place where futures can be imagined freely without limitation. While the installation is based on Coltrane, it speaks about the ability power of the Black woman to elegantly and creatively transcend oppressive forces, which LaFleur believes Aretha Franklin embodies. Franklin transcended many traumas, known and speculated, found and protected own safe space from which to create, share and, ultimately, change the world. As a recent Detroit Mayoral candidate and founder and director of AFROTOPIA, LaFleur implements Afrofuturist strategies to empower Black bodies and oppressed communities through frameworks such as blockchain, cryptocurrency, and universal basic income. Ingrid LaFleur is currently the co-founder and Chief Community Officer of EOS Detroit. As a thought leader, social justice technologist, public speaker, teacher and cultural advisor she has led conversations and workshops at Centre Pompidou (Paris), TEDxBrooklyn, TEDxDetroit, Ideas City, New Museum (New York), AfroTech Conference, Harvard University and Oxford University, among others. She serves as board chair of Powerhouse Productions, a founding member of the Detroit Culture Council, board member of the Cooley Reuse Project and ONE Mile, and advisory board member of Culture Lab Detroit. Pretty Bald addresses the issues African American women face with standards of beauty, particularly hair. The text at the bottom of the piece reads “Freedom” which an individual might attain when she accepts and has achieved her own personal standard of beauty; the line also references the powerful refrain in the Aretha song “Think”. Through her music and personal style, Aretha Franklin became an advocate for women’s empowerment and freedom, as well as a fashion icon, in her own right. She exuded confidence in both her beauty and power, whether she wore a press and curl, an afro, or a wig; whether she was big or small; whether she was in stellar health or in her final moments, unwell. Franklin donned many styles and looks over the course of her public life, and never seemed to hide behind any one of them. She exercised the freedom to change and to oscillate – musically and visually. The figure in my piece has removed her wig and found “freedom,” as Aretha sang, by embracing her natural hair. The piece urges us all to find the beauty in everything, naturally, that we are. Beau McCall began his career in Harlem after arriving from his native, Philadelphia with nothing more than two hundred dollars, a duffel bag and a few buttons in his pocket from home. Two years later he made his critically acclaimed debut with wearable art at the Black Fashion Museum show for Harlem Week. McCall went on to become an established force within the Black Fashion Museum collective presenting at their shows consecutively for ten years, as well being featured in their museum exhibition and prestigious events. During this time, McCall’s visually captivating work was featured in the fashion bible, Women’s Wear Daily and on PBS. Since then McCall has begun to focus solely on creating visual art. McCall is also a noted creative arts expert providing commentary for media outlets such as Rolling Out magazine, MadameNoire.com and AtlantaPost.com. McCall remains committed to channeling and contributing to the universal cultural legacy one button at a time. Aretha Franklin sang a pain and passion that stirred the whole world. She brought God to the ears of the unbeliever. She opened and lived within our hearts and became the Heart of Detroit. Nails, shackles, and other objects of subjugation and pain found in these works, in contrast to soft hearts, bring Aretha to mind – the stories of love, pain, desire and demand that she told; the loving spirit that kept her in Detroit, serving her family, church, and community, and; her tough as nails, scar-less exterior which served as a dynamic feminine vessel. The pieces are dedicated to Aretha, her interior softness, her woman-ness, her undeniable existence as a SuperNatural Woman. Donald Calloway has been actively involved in Deyroit’s art scene for over twenty years. Calloway recognized his passion for the arts at the tender age of three and has been solely dedicated to his artistic endeavors ever since. He learned the technical aspects of the arts at the Center for Creative Studies in the 1980s and continued his dedication at the Greektown Lofts, where his studio still resides. Calloway’s mixed-media art specializes in oils, watercolors, pastels, drawings, paintings and sculptures. Although Calloway delve in numerous outlets, his meticulous constructions, intentional brush strokes, and bold use of colors erupt a unique and aesthetically dynamic vision that grabs his audience no matter what style or medium. Calloway has exhibited his artwork at the Charles H Wright Museum of African-American History, Arts Extended Gallery, Delta Sigma Theta, and the National Conference of Artists (to name a few). In addition, his art has also taken him to such cities as New York, Washington D.C., and Chicago, however despite Calloway’s out of state success, he proudly proclaims that Detroit is always considered home. “I wasn’t literally born in a record shop, but I might as well have been, growing up as I did, the daughter of a legendary pre-Motown record producer – Joe Von Battle – and working and playing in our records shops during all of my young years. I have had a unique view of America’s economic and musical explosion of the last half of the 20th century. I grew up in Highland Park – a “city within the city” of Detroit – during its lush, green, prosperous days. However, I spent a good part of my life around my father’s old Hastings Street and 12th Street record shops. I was witness to the intense “street life” and the excitement of music and life in the tumultuous 1960’s. Hastings Street was the western border of and main thoroughfare of Black Bottom – the community to which most African Americans coming to Detroit from the South were relegated, due to segregation. After the demolition of Detroit’s Black Bottom, starting in the late 1940’s, Hastings Street survived until about 1960. The record shop was then demolished to create the I-375, aka Chrysler Freeway. After the destruction of Hastings, the record shop moved, with other surviving businesses, to the West Side of Detroit, on 12th Street. Soon, Joe was recording Rev. Franklin’s Sunday night sermons and songs, mostly on the Battle and Von labels. Joe Von Battle was the sole producer/recorder of the sermons of Reverend Franklin and this was a relationship – and friendship – that was to last through 75+ albums and records, for many years. My father initially released and distributed the records himself, mailing them all over the country as demand for them increased. After a time, the songs and sermons of especially Reverend Franklin were mainly released and distributed by Chess records, where my father had numerous recording and financial arrangements. My father would play Rev. C.L. Franklin records through loud-speakers onto the street, and passersby would gather in great crowds to hear the sermons and Psalms; the police often came to control the crowds. Joe’s recordings of Rev. Franklin’s sermons, done at the church, were clear and electrifying, capturing the excitement of Franklin’s choir and church services. Many a night after church, Ms. Aretha, Reverend Franklin’s daughter, sat playing that piano and having a good time with my older half-brother and three half-sisters, who worked at the shop with my father (in later years, my brother and I surely plunked that old instrument out of tune). Joe Von Battle was the first to record her voice as she sang in the New Bethel Baptist church choir. He produced her first record, the gospel song, “Never Grow Old” when she was 14, and went on to produce many of her gospel songs before she moved to the larger record labels to sing secular music. Marsha Music was born in Detroit and grew up in Highland Park, Michigan – a city within the city of Detroit. She has lived in these two cities her entire life. She is the daughter of legendary pre-Motown record producer, the late Joe Von Battle, and west side Detroit beauty and music lover, the late Shirley Battle. Ms. Music is a self- described “primordial Detroiter,” and a “Detroitist”. She became an activist in her early teens in the social tumult of the late sixties, and was founding member of the iconic League of Revolutionary Black Workers. She was later a labor union president – the first Black, first woman and youngest in her local union’s history. Throughout all, she has been a writer, and has penned acclaimed essays, poems and narratives about the city’s music, and its past and future. She is a self-educated scholar, a noted speaker and presenter, and has contributed to important anthologies, narratives, films, oral histories, and an HBO documentary. In 2017 she was a narrator in the documentary film 12th and Clairmount. Ms. Music was awarded a 2012 Kresge Literary Arts Fellowship, as well as a 2015 Knight Arts Challenge award; she was a 2015 Ideas City Detroit Fellow, and has received accolades for her One Woman Show, Marsha Music – Live On Hastings Street! In 2015, she was commissioned to create a poem about Detroit for the acclaimed Symphony in D, which she read in performances with the Detroit Symphony Orchestra. A Detroit cultural luminary, Marsha was the opening speaker for the July, 2016 opening of the Detroit ’67 project at the Detroit Historical Museum, and was commissioned to create a poem for the Belle Isle Conservancy. She plans a book and a documentary film about her father’s record shop, with veteran Detroit film-maker Juanita Anderson, as well as a memoir of her own amazing life. In addition to her writing, she pursues a life of fiberworks, cultural events, and style. Steven Lopez, born in Los Angeles, has been heavily influenced by hip hop culture and graffiti art. He is a painter who has emerged from the graffiti subculture and academic influence. While attending the University of Oregon, Lopez studied under the guidance of master sculptor Dora Natella and design theorist, Leon Johnson. Lopez absorbed the attention to form associated with Natella’s sculptures, while refining his conceptual vocabulary through Johnson’s critique on visual continuity. He received a Bachelor of Fine Arts in 2001. Lopez’s work can be found within a myriad of corporate and private art collections both in the United States and abroad. His After Midnight Series is dedicated to African American women soul singers including Chaka Khan, Lauryn Hill, Alicia Keys, Erykah Badu, Jill Scott and, most notably, Aretha Franklin. The video series highlights audio collaborations with DJs and demonstrates his artistic process. Lopez currently lives and works in the City of Los Angeles. Kim Hunter is a lifelong Detroiter employed in media relations for nonprofits. He has served as Poet-in-Residence in several Detroit public schools through the InsideOut Literary Arts Project. He co-directs the 10-year old Woodward Line Poetry Series. His work has appeared in such publications as Rainbow Darkness, Abandon Automobile Triage, Hipology, Metro Times, Dispatch Detroit and Graffiti Rag. His has published two collections of poetry: “Borne on Slow Knives” (Past Tents Press, 2001) and “Edge of the Time Zone” (White Print Inc., 2009). Omo Misha has enjoyed a multi-faceted career in the arts and education. Currently serving as Gallery Director for the Irwin House Global Art Center & Gallery in Detroit, MI., she has worked in programming and development for the LeRoy Neiman Art Center and the Children’s Art Carnival in New York. Her curatorial catalog includes projects for City College Center for the Arts, Community Works NYC, Jack & Jill of America, Inc., No Longer Empty, Harlem Community Development Corporation, Helene Fuld College, the NYC Parks Department and Columbia University. She has worked in education with the Curriculum Art Project at Symphony Space since 2003, facilitated programming for The Sugar Hill Museum of Art & Storytelling, and continues to impact the lives of hundreds of children per year through her work with not-for-profit and educational institutions, as well as independent projects. As a talent, Misha has executed public art installations on behalf of the Harlem River Park Task Force and the 125th Street Business Improvement District and; has been awarded artistic grants by the Lower Manhattan Cultural Council, Puffin Foundation, and Harlem Arts Alliance, and; has been a contributing writer to Huffington Post and Of Note Magazine – which features global artists using the arts as tools for social change. While the Aretha SuperNatural exhibit was assembled to honor Detroit’s Queen of Soul, our impetus had every bit to do with this neighborhood – the gallery’s spatial relationship to Franklin’s childhood home and her father’s New Bethel Baptist Church, and a profound sense that we are building on the same rock that buttressed young Aretha’s life and career. Here we are in the midst of it all, with Hitsville up the block, signs of historic black businesses still peppered across The Boulevard, and the aftermath of the ’67 riots palpable fifty years later. In paying tribute to Aretha, we also honor this West End Detroit community from which her voice first rang around the world, and all it has endured, cradled, and inspired. Through pictures and words, Marsha Music, shares a family story, a Detroit story, a story of Aretha and how this neighborhood grew to become a Detroit focal point of black music and enterprise…. In September 2018, The Irwin House Global Art Center & Gallery opened in West End Detroit with a grassroots exhibition in honor of the Queen of Soul, Aretha Franklin. Still under construction, the gallery pushed for an early opening to provide a space for Detroit local artists and invited creatives to reflect on the spirit of Aretha through visual, literary, and performative arts. The resulting exhibition – SuperNatural Woman: Tribute to the Queen – has been curated by Gallery Director, Omo Misha, with conceptual artist and writer, John Sims, and features the work of Amber Doe, Amir Bey, Artis Lane (courtesy of N’Namdi Center for the Arts), Cyrah Dardas, Donald Calloway, Ingrid LaFleur, Jason Phillips, John Sims, Lorna Colin Braxton, Makeba Rainey, Marsha Music, Noreen Dean Dresser and Steven Lopez. Using a range of media, these artists have shared memories and explored Franklin’s life, music and impact as a woman, matriarch, activist, and die-hard Detroiter. everywhere are invited to submit their work to the site. Throughout the Fall, the Irwin Gallery welcomed art-enthusiasts, Aretha-lovers, students, and tourist groups to the exhibit, while continuing work on the building. “While we would have preferred the gallery to be more complete before opening, it felt critical to carve out a place to honor Aretha in her community,” states Omo Misha. “It has been heartening, for us, to welcome company as we approach the end of a long and hard-fought rehab process.” The gallery and exhibition opening was covered by The Detroit News and the Metro Times, gaining the cover of its Fall Arts issue. The closing of SuperNatural Woman on Saturday, January 19, 2019 will be marked with a ‘60s style house-party fête in honor of Aretha, the music of Detroit, and the pride and beauty of the era that delivered so much iconic soul and style to the world. Native Detroiter and co-host, John Sims, will be in-house from Sarasota. The soundtrack for the night will be curated by cultural activist, Drake Phifer. And, guests are encouraged to don their funkiest ‘60s, Aretha-inspired attire. 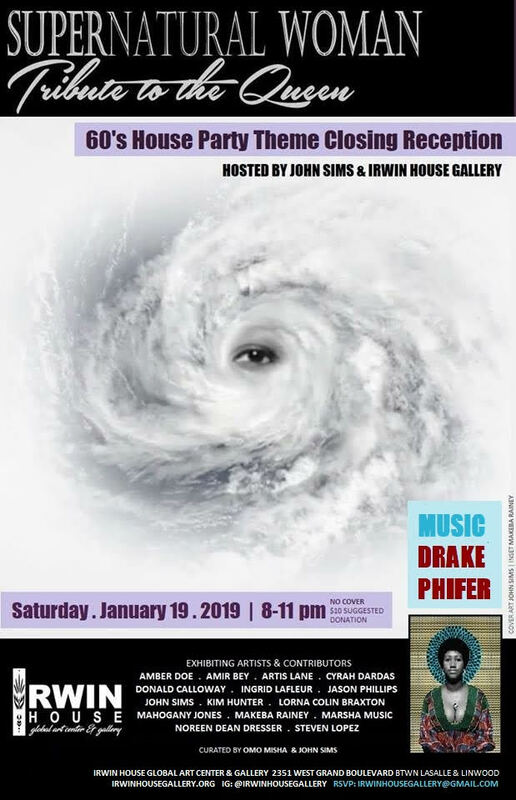 The ‘60s Themed Closing Reception takes place at The Irwin House Global Art Center & Gallery on Saturday, January 19, 2019 from 8:00-11:00 pm. There is NO COVER but a suggested $10 donation helps to support the not-for-profit gallery and its programs. Guests wishing to preview the exhibition may arrive between 5:00-8:00 pm for personal or self-guided tours. On September 21, 2018, we opened our doors early to celebrate the Queen of Soul, Aretha Franklin, with a very special exhibition, featuring local and national visual and literary talent. Thank you to all participating artists, and to all who came out to celebrate The Queen, as well as the opening of our new space. The work here is still on-going, so we especially thank you for being a part of our construction and transformation process. New Bethel Baptist Church, where Aretha Franklin first took stage, is a stone’s throw away from The Irwin House; the family home, even closer. Our cross-streets, LaSalle and Linwood, are the streets Aretha was raised on and where she went to church, respectively. Linwood, in fact, was renamed C.L. Franklin Blvd, after her minister and activist father. We are sitting in the midst of Aretha’s home turf. No one can know how close Detroiters feel to our legendary artists. Nearly every one of us has a story…about a neighbor, co-worker, schoolmate, babysitter, or mother’s cousin’s friend who was one of Motown’s greatest. We can casually point out their houses, and sometimes their relatives houses. We went to school with their children. We own the music because it sprang from our experience. And, the magical souls who made it are nothing less than aunts, uncles, cousins, sisters, and brothers. Deep in our hearts, they are family. And, Aretha Franklin was, and remains, the mother-lode. For every homegrown Detroiter, Aretha Franklin embodies the spirit of our great city: Her absolute excellence in her craft, her strength and resilience, her unabashed and unwavering presence of self, and her mystery, which could only be deciphered from the sacred inner circle. The fact that Aretha remained one of us ’til the end was a source of pride we carried deep within our cells. With change sweeping through the city, and a Black uncertainty that most of us here have never known, she gave us one quiet confidence that soul still lives here – that it hasn’t entirely been bought, sold, displaced, silenced, replaced or moved to the suburbs. She and her gifts belong to the world but, mostly – and what she made clear – she was ours. Heartfelt tributes at New Bethel Baptist Church, C.L. Franklin Blvd. The Irwin House will honor our sister and neighbor, Aretha Franklin, with SuperNatural Woman: Tribute to the Queen – an exhibition featuring visual, literary, and performative works exploring the multi-facets of Aretha and the riffs that sought to empower us for six decades strong. That well has stopped flowing, but will never be silenced. We owe it to Aretha, the Black experience, and Detroit, to continue to share and learn from her story, our story, and to make sure history gets it right. This is, perhaps, the most important function of art. The exhibit will open Friday, September 21, 2018. For inquiries and artist submissions please contact irwinhousegallery@gmail.com. Happy 2018 from The Irwin House! Happy New Year! I can’t believe it’s been 365 days since we uttered these celebratory words! Our doors have not opened to the public yet, but we’re happy to have strengthened our alliances with community partners, supporters, friends, and artists in this past year, and witnessed positive changes coming to our WEdetroit community. And, yes, we’re making strides of our own! Admittedly, summer was challenging as we attempted to focus on the exterior of our establishment – including signage, landscaping, painting, and external repairs to the structure. Given the unforgiving Michigan winters (in full swing right now!) we’d hoped to complete these outdoor tasks so we’d be curb-ready in the event of winter grand opening. Thanks to our friends at RockStar Group, we did make headway on the signage (below). But, to put it nicely, we never seemed to forge the right relationships with the right contractors to get the rest of the work completed before snowfall. We’re still working on that, and welcome your recommendations. Until Spring (which seems so far, far away) we’ve focused our attentions back indoors, and may indeed have a blustery Winter opening. We’ll keep ya posted! In the meantime, we were proud to exhibit work at The Carr Center as part of the Detroit Diaspora exhibit curated by Michael Kelly Williams and Dr. Cledie Taylor. We are also looking forward to showing work from the Irwin Collection in an upcoming group exhibit at the Charles H. Wright Museum of African American History. (Your invitation to the opening is in the mail!) We’re looking forward to a great year ahead, making new friends, supporting and building the arts in Detroit, and so much more. A little landscape inspiration from this charming WEdetroit home! Thank you so much, Detroit and beyond, for being a part of our journey! What A Difference $25 Makes! Earlier this month, we embarked on a fundraising campaign that we expected would last up to 45 days. Yet, to our astonishment, we met our $4,000 goal in less than one week! Why? Because this on-line community of giving, sharing, and supporting simply rocks! That community is Kiva – the world’s first and largest micro-lending service. As of this week, Kiva celebrated the distribution of over 1 billion dollars among nearly 2 million small businesses, in more than 80 different countries. With as little as $25, anyone, from almost anywhere in the world, can help aspiring entrepreneurs and change-makers build community and prosperity. And, through the support of 61 generous lenders – most of them strangers – The Irwin Gallery experienced, firsthand, how fabulously powerful $25 can be. A proven and self-described “global force for good,” Kiva exemplifies the remarkable strength of ordinary people, and provides a window into the world as it should be. The Irwin Gallery is so incredibly honored and humbled to be a part of this magic – especially in the age of “No” and proliferating predatory (corporate) practices. In the midst of systems, institutions, authorities, and even lifestyles malfunctioning the world throughout, Kiva has been consistently, increasingly and simply, working. With this 0% interest loan, we look forward to continuing construction on our space – which includes a critical electrical upgrade, lighting, insulation, and some walls and ceilings. This doesn’t cover all of remaining costs but, it gives us a vigorous push that puts opening day well within reach. For us, and for 2.4 million others around the world, Kiva has changed the game. We are so encouraged and grateful that we have been inspired to pay it forward by lending to others through the Kiva platform, even as we work toward our own goals. We invite you to do the same: If you are a small business-owner, the global Kiva community is waiting to assist you; or you can search the site for the next generation of entrepreneurs, whose lives you can change with as little as $25. Or, both! Learn about The Irwin Gallery’s recently disbursed Kiva loan HERE! Join us in lending to other Kiva entrepreneurs HERE! Find out about becoming a Kiva borrower HERE! Special thanks to NYC Business Solutions and the supportive Kiva team! As we prepare the Irwin House for opening, one distressing issue has been the burned out house a few doors down. Although, there had been complaints of suspicious activity and local authorities called to the property over the years, the blight had at least been relatively hidden by brush in the warmer months, then snow in the winter. No real comfort in that, however – even though we didn’t have a clear view of the house, who knows what lurked in the shadows. Wildlife was the least of our concerns. This winter brought minimal snow and certainly there no leaves on the trees, offering us a ghastly, unobstructed view of the site. Crumbling, hollowed, and garbage-strewn, the property behind the trees was far worse than we’d imagined. How could we welcome world visitors to our block with a virtual haunted house sitting just yards away? How could we tout the power and benefits of art with no control over the safety and aesthetic of our own vicinity? What power did we have to beautify, or otherwise rectify the site, especially with neighbors abusing it for their personal refuse. Years of complaints seemed to fall on deaf ears. But, the City was listening. While we waded through bureaucracy to try to figure out how to get the structure demolished – with the support of Mildred Hunt Robbins of the West Grand Boulevard Collaborative (WBGC) and DeAndre Calvert, Community Liaison for Councilmember, Mary Sheffield – the City of Detroit responded. On Tuesday, March 21, 2017, a demolition crew showed up around 8:30 am. By 3:30 that afternoon, the abandoned house and all the debris it entailed, was history. Crews returned over the following couple of weeks until a blemish-free landscape was delivered by the close of the first week of April. The City of Detroit’s Demolition Program has not been without its criticisms and setbacks. More than 11,000 blighted structures have been leveled since it started in 2014, but the program fell under investigation in 2016 amid concerns about escalating costs. Removal activity was suspended for two months, and resumed only after the City adopted several new protocols in light of federal concerns. Many citizens are impatient to learn when, or if, demolition will be coming to their block. Whatever your feelings are about the program, it is improving the quality of life for Detroiters and expanding possibilities for the city. We don’t know what will become of the new vacant lot on our block – we won’t be buying it, we’ve got our hands full – but, we look forward to creative new neighbors, wishful innovations, or even fresh public space, soon to add to the historic landscape of West Grand Boulevard! Learn more about Detroit’s Demolition Program HERE and find out where they’re going next and where they’ve been! Happy 2017 from The Irwin House! It’s a new year, and with it comes a great many changes and uncertainties. Those of us who live and love the arts know for sure, however, that art feeds the soul, strengthens communities, and can even create change. As the Irwin House team forges ahead with renovation (a process that has, admittedly, taken longer than we’d hoped) we are keeping our eye on the prize – creating change, with YOU, in our proud Detroit community! While we work through these final kinks (floors, lights, and getting pretty! ), we invite you to keep in touch with us here for progress reports and other art news. Please don’t hesitate to reach out and say, “Hello!” We’d love to hear from you and begin building friendships and partnerships even before our doors open. Special thanks to our friends at West Grand Boulevard Collaborative (WGBC), Arts Extended Gallery, N’Namdi Center for Contemporary Arts, and the Detroit Artist’s Market for warmly welcoming us to Detroit’s vibrant artistic landscape. We can’t wait to join you in keeping our city strong through the arts!